The eighth film in the popular Saw horror-movie franchise, Jigsaw, gets a new, disturbing teaser poster as the marketing for the film gets underway. The long-running horror franchise Saw is back for film number eight, with directors Michael and Peter Spierig set to direct. The Spierig brothers’ last film was the fantastic, yet underrated sci-fi film Predestination (2014) starring Ethan Hawke. The first Saw film came out 13 years ago in 2004, and was the brainchild of young Australian writers James Wan and Leigh Wannell. Wan directed that film, with Wannell starring, and it instantly went on to become a massive Hollywood success, spawning seven sequels and changing the modern-horror movie game forever – not bad for a couple of young Melbourne boys. The two have gone on to create promising careers for themselves in Hollywood, with Wan basically sitting up-top with the industry elite as of this writing. The next film, Jigsaw, appears as though it will see the return of the Jigsaw killer, whom has been presumed dead for over a decade. 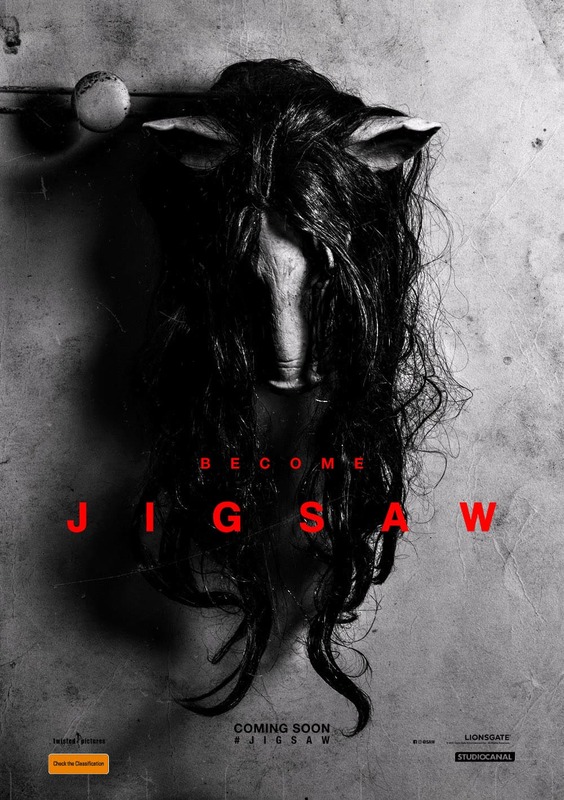 I stopped watching the Saw films after about the 4th one, so I’m not sure at which point Jigsaw was killed, or what the tagline ‘Become Jigsaw’ in the new poster below refers to (maybe someone can enlighten me in the comments). The first Saw film was fantastic, a real game-changer, and while its sequels couldn’t quite reach the same heights, there has been enough of a fan-following to warrant the production of so many of them. I may not be the biggest Saw fan since the first one, however I’m all for keeping movie franchises started by local talent alive as long as possible, and anything to help the horror genre succeed in the mainstream. Jigsaw stars Tobin Bell, Mandela Van Peebles and Laura Vandervoort, and is due out on 2 November 2017. The Spierig Brothers will also appear at San Diego Comic Con International for a special Reinventing Horror panel 21 July 2017. Check out the creepy new poster below.